Eggs are seen below a nesting killdeer bird on a cobblestone path on the site of the Ottawa Bluesfest, on June 25, 2018. A plan hatched by an Ottawa music festival to relocate a tiny plover and its egg-laden nest has received the go-ahead from federal environmental authorities. Environment and Climate Change Canada said it is issuing a permit for Ottawa Bluesfest organizers to move the killdeer and its four eggs to a nearby suitable habitat. 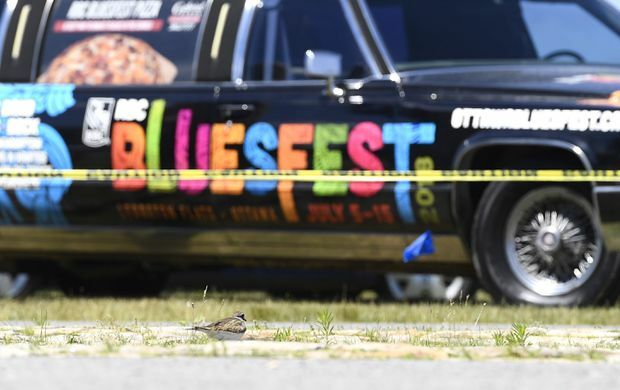 Mark Monahan, Bluesfest executive director, said an official who has a federal licence to handle migratory birds is on her way to help move the eggs. “We’re hopefully going to have the nest and the eggs to a safe location by the end of the day,” Monahan said, adding that setup work on the stages should start soon. Environment and Climate Change Canada said in a statement Tuesday that the relocation will allow the nest to remain – and the eggs to hatch – in a natural environment. The bird and its eggs – both of which enjoy protected status in Canada – were nestled on a cobblestone patch that would normally be directly underneath the main Bluesfest stage. Still, moving the nest required federal approval, which arrived ahead of a deadline that would have caused a cascade of construction problems for the 11-day festival, which gets under way next week. A spokeswoman for the National Capital Commission said the Woodlands Wildlife Sanctuary in Minden, Ont., some 300 kilometres west of Ottawa, will be involved in the move. Workers came across the killdeer last week when they arrived at the festival venue, which is currently being set up for a July 5 start date. What the workers described was an agitated bird – the usual defensive habits of an adult killdeer when a threat or intruder has come too close to its nest. The festival identified locations about 50 metres from the main stage area for a new perch for the killdeer – areas that aren’t used during the festival and could be cordoned off. The spots are far enough away that they won’t be disturbed by the hundreds of thousands of music fans who will trample through the festival grounds to see the likes of Shawn Mendes, Bryan Adams, Foo Fighters and Dave Matthews Band, among a host of other acts.